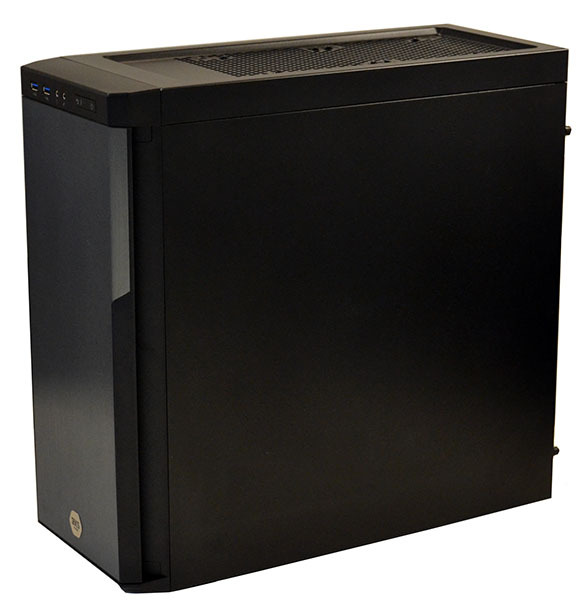 The line between high-end desktop (HEDT) and workstation PCs has been blurring year on year. This is in no small part due to Intel using very similar technology on both fronts, with the latest Xeons and Core i9 chips armed with lots of cores and bags of performance. Run in a uniprocessor environment, there really is no good reason, other than ECC memory, for many entry-level workstation users to look past the Core X series or, for that matter, the latest performance Threadripper chips from rival AMD. GPU decisions are more contentious, as both Nvidia and AMD have professional ranges built on the guts of consumer technology. Often costing multiple times as much as their consumer cousins, these professional cards have ISV-certified drivers that excel at various workstation applications. Thinking about the market as a whole, a thoroughly modern workstation in 2017 would likely take in an Intel Core X-series processor and Quadro graphics from Nvidia. We have such a system in from Scan Computers today - the 3XS	WI6000 Viz - designed for high-end digital content creation. 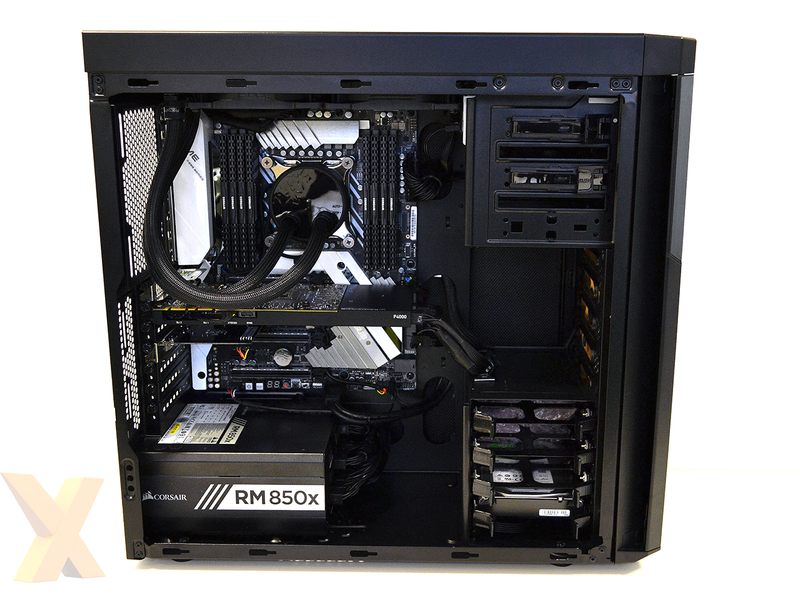 Said machine is wrapped inside a Corsair Carbide 330R Titanium featuring sound dampening as standard. This no-frills case is a solid fit for a workstation, and is able to house a high-end build with comfort, including adequate mounts for watercooling. Though plain on the outside, the system packs a considerable punch. A Core i9-7980XE chip - the fastest consumer processor on the planet - is overclocked from its default 2.6GHz to an all-core 4.2GHz. Though Scan Computers prefers to use air coolers in workstation PCs, the thermal dissipation demands of an overclocked, overvolted 18-core processor are such that it chooses a Fractal Celsius S24 all-in-one cooler, as featured on the recently reviewed Vengeance Ti. A proven solution that's also quiet to boot, it's a good fit for a system of this ilk. We've run our own Core i9-7980XE at 4.5GHz on air, albeit with it nearing the edge of reliability. Scan says it dials down the speed of its workstation chips due to the clear need for long-term stability. Peering inside, sitting either side of the Asus X299 Deluxe CPU's socket is 64GB of Corsair DDR4-3,000 memory, while a DVD ReWriter is a surprisingly common addition to these kinds of systems as users still rely on optical media more so than the consumer space. Cabling is neat and tidy, as one would expect, and the only conspicuous power cable is the one snaking its way out to the Nvidia Quadro P4000 professional graphics card. Said GPU is the most powerful single-slot card in Nvidia's arsenal. Built on the Pascal architecture and using a derivative of the GP104 die, the 105W board features 1,792 shaders and 8GB of GDDR5 memory running at 7,600MHz. It most closely resembles a desktop GTX 1070, though costing £850, it is almost 3x as expensive. But as you will see on the following benchmarks, it can run rings around a consumer GeForce GTX 1080 Ti on some applications, thanks in main to certified drivers. Storage is taken care of by a tried and trust combination of a 512GB Samsung 960 Pro M.2, situated underneath the motherboard's heatsink, and 2TB Seagate Barracuda HDD. What you don't see is that Scan has upgraded the default Corsair intake fans to two quieter, better-performing Noctua NF-A14. 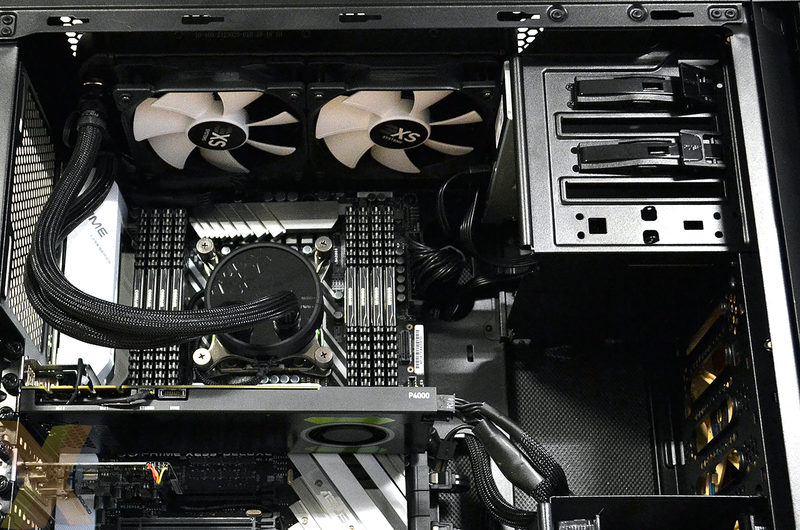 There's a reluctance in the industry to move to front-mounted USB 3.1 Gen 2 Type-C - chassis don't feature it because most motherboards don't, and vice-versa - but here the choice of Corsair chassis is the culprit; the motherboard's speedy port goes begging. What else in terms of connectivity? Scan adds in a combination Thunderbolt 3 and USB 3.1 Gen 2 PCIe card, though we wonder why Scan hasn't installed the card further down and nearer to the Thunderbolt header on the Asus board. Corsair is also the go-to solution for the power supply. The RM850x is an 80 PLUS Gold PSU which, from our tests, has proven decent across a range of tests, notably ripple suppression, though we do ask ourselves if a £4,699 system deserves a Titanium-rated supply instead. These kinds of rigs are designed to run 24/7 under maximum load, thus any energy efficiency savings will mount over time. Scan backs the workstation with its standard three-year warranty, with the first being on-site and second and third years back to base. The system arrives well-packaged and, in an effort to keep everything safe and secure, the inside of the chassis is filled with antistatic bubble wrap - a remnant of which you can see just by the Seagate HDD in the second picture. This is a PC designed for supreme CPU-side performance and solid numbers from the GPU when run via applications that benefit from ISV-certified drivers. Let's now see just how fast it is in a new range of workstation benchmarks.